A versatile, very well-equipped apartment to rent in the French Alps resort of Vallandry. Nestled between Les Arcs and La Plagne, in the spectacular region of Paradiski, you can enjoy superb skiing in the winter, and a variety of walks and outdoor pursuits in the summer. Conveniently situated within a two minute walk of an excellent choice of restaurants, ranging from takeaway pizza places to à la carte, offering local Savoyard specialities, plus a selection of lively bars, some of which host live music and dancing. Vallandry has a supermarket, plus patisserie, boucherie and charcuteries, as well as several ski equipment and hire shops. Bourg St Maurice has three large supermarkets. The apartment, which is part of the Crêt De L'Ours complex, is a comfortable 48m square, and sleeps six adults or two families, with ease. The apartment is very well equipped for self catering. In winter the resort has great all round appeal. For experts the exhilarating black and red runs down from the Aiguille Rouge glacier represent a serious challenge. The Peisy-Vallandry ski area also offers great beginner and intermediate skiing, without the queues which can build up in other areas. Les Arcs is a snowboarder paradise, with the famous Olympic runs and board park at Arc 1600. Situated just above the main Vallandry chairlift, and just below the fast six-man Grizzly chairlift, the apartment is ideally positioned to allow ski in and out access for the majority of the winter season. Summer Fun in Les Arcs and VallandryIn summer, there is immediate access to the upper and lower slopes, where there is a huge variety of marked trails of differing lengths and levels of difficulty, which can be explored on foot or mountain bike. For those who want even more adventure, there are lots of activities to choose from nearby, for example there's hiking in the Rosuel National Park, parapenting, canyoning, white-water rafting, cycling, horse riding, via ferrata, tennis, golf, archery, parcours, and a road cyclists paradise. 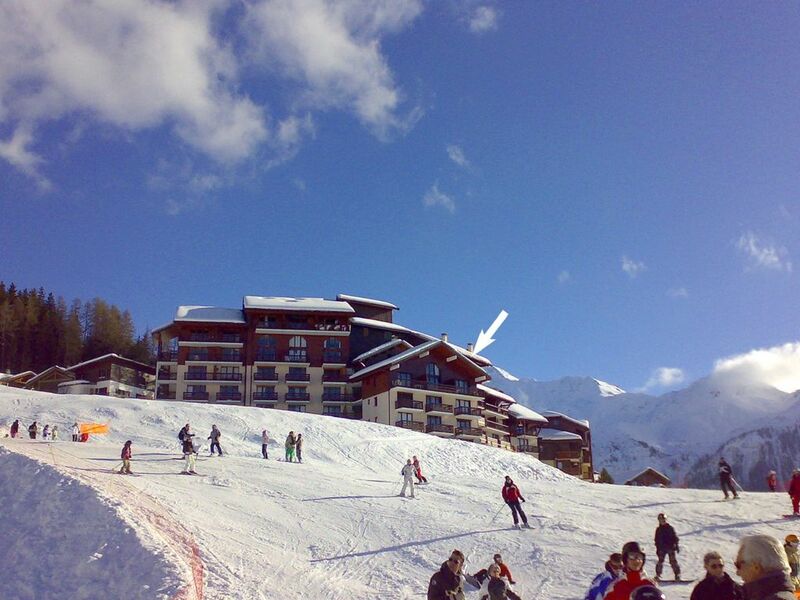 Crêt De L'Ours is situated in a prime location, on south facing slopes, directly above the village centre. The 6th floor apartment is well appointed, with spectacular views, sleeping various combinations of adults and children on two levels. Located just above the main Vallandry chairlift, and just below the express six-seater Grizzly chairlift, you can be quickly on the sunny and picturesque slopes of Vallandry. The apartment is 300 metres from the Vanoise Express, Europe's biggest cable car. You are a 4 minute ride from the vast open spaces and off-piste of La Plagne. What a choice to start each day - Vallandry, Les Arcs, La Plagne? The apartment is centrally heated throughout, and we have additional heating for cold spells. Downstairs the apartment has a spacious lounge/diner, with an open fire, futon, table and six chairs. There is a wide selection of games and books for use by guests. The kitchenette is well equipped, with combi oven/grill and microwave, twin electric hobs, and an additional convection hob, kettle, iron and ironing board, dishwasher and fridge. Downstairs has an additional room with futon, which converts to a double bed. This is separated from the entrance lobby by a curtain. The downstairs bathroom has a bath with shower attachment, and a separate WC. Upstairs there's a shower room with shower, sink and WC. Upstairs has two bedrooms, four bunks in one, and a double master bedroom. There are also two single futons on the mezzanine, for unexpected visitors. We also have a TV for watching DVD's. A split balcony, with barbecue, faces south and west (sunshine all day), with fantastic views of the Savoie/ Tarentaise valley and Mont Blanc. The apartment has its own secure underground parking space, and a double ski locker. Access to the apartment is by lift to the 4th floor. Bed linen and a full cleaning service are provided for the winter season (towels are not provided). There is a laundry service (Skimanque) in Vallandry, and a self-service laundrette at Super U in Bourg St Maurice in the valley. •a 10 second ski to the lift! central heating + additional portable and wall mounted heaters. Well equipped kitchen. Double hob. Additional hob and combi grill/oven/microwave. Les photos ne reflètent pas assez le confort de cet appartement! L'entrée est grande et bien aménagée pour ranger chaussures et combinaisons (plus: chauffage d'appoint pour faire sécher les tenues). Il y a un lit double au rdc dans le hall, une salle de bain (avec baignoire) et toilettes séparés. La salle à manger/cuisine est bien équipée et fonctionnelle avec une très belle vue sur la montagne (lave-vaisselle, micro-ondes, frigo. Moins: pas de four ni de grille-pain. Vaisselle, ustensiles et plats en quantité suffisante. Grande table avec 8 chaises, canapé et cheminée fonctionnelle). Grande terrasse. A l'étage, il y a un petit espace télé sous pente, une vraie chambre de 4 lits superposés, haute de plafond et avec des tiroirs de rangement (plus une commode à côté), une chambre avec un lit double très confortable et une armoire, et enfin une deuxième sdb avec wc et douche. Nous étions 6 (3 adultes et 3 enfants) et ne nous sommes pas du tout marchés dessus. Propriétaire disponible et sympathique (par mail), gestion simplifiée (pas de caution, pas d'état des lieux: vous prenez les clés au bar d'à côté - le "Mont Blanc" - et vous les redéposez en partant) et draps fournis. La station de Vallandry est très agréable, il y a tout ce qu'il faut, les pistes sont très bien et plus jolies qu'aux Arcs ou La Plagne, et il y a plutôt moins de monde.